Lyons, IN - In excess of 200 cars participated this past weekend during the Ohio Crankshaft No Box Nationals in Lyons Indiana. 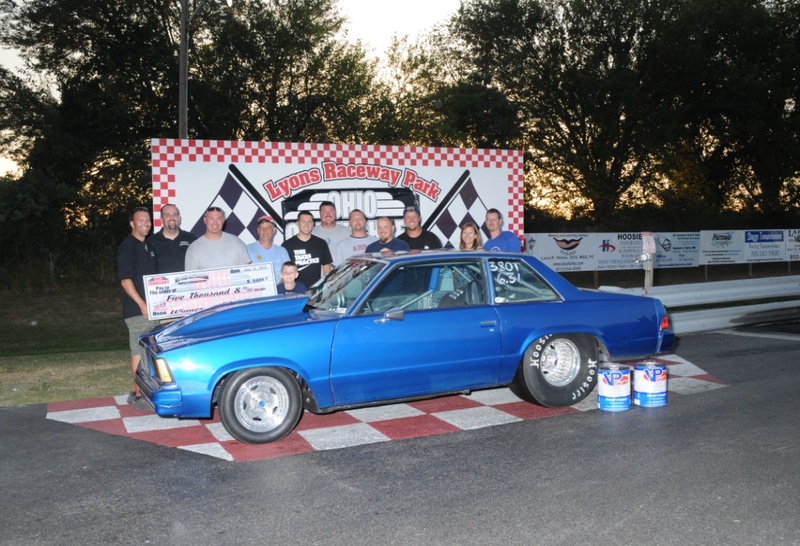 Randy Biddle, Jr, Tesz Powell and Joe Robertson Sr all scored big in the main events, while Cody Nott took the win in the Memorial Race over Eric Bowling. Complete Results and Photos. 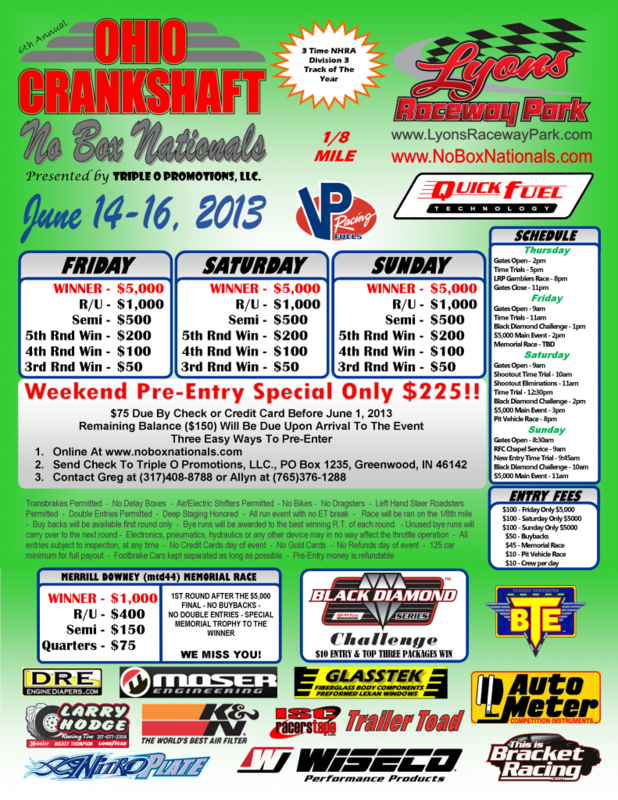 Lyons, IN - Triple O Promotions returns to Lyons Raceway Park this weekend with their 7th Annual Ohio Crankshaft No Box Nationals. Nitroplate presents 3 days of $5,000 to win No Box Action. Gates open Thursday at 2pm with a Test-n-Tune and gamblers race to be held. Lyons, IN - Great weather coupled with outstanding racing, made this years Ohio Crankshaft No Box Nationals one of the best to date. 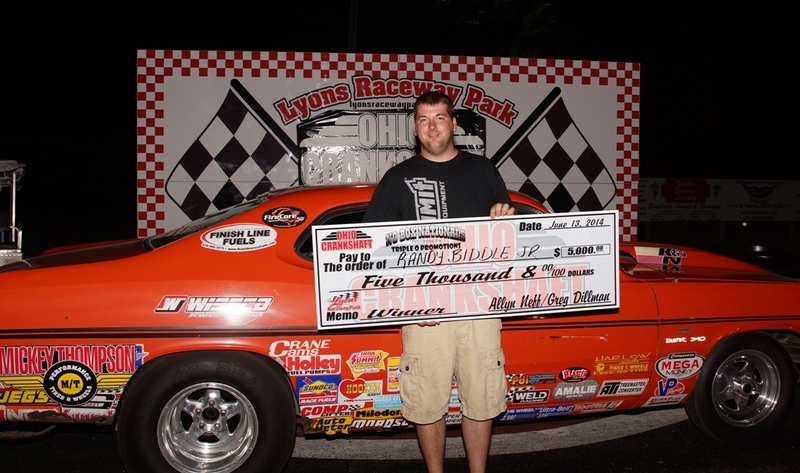 Corey Wood kicked off the racing action with Friday's $5,000 Main Event win. 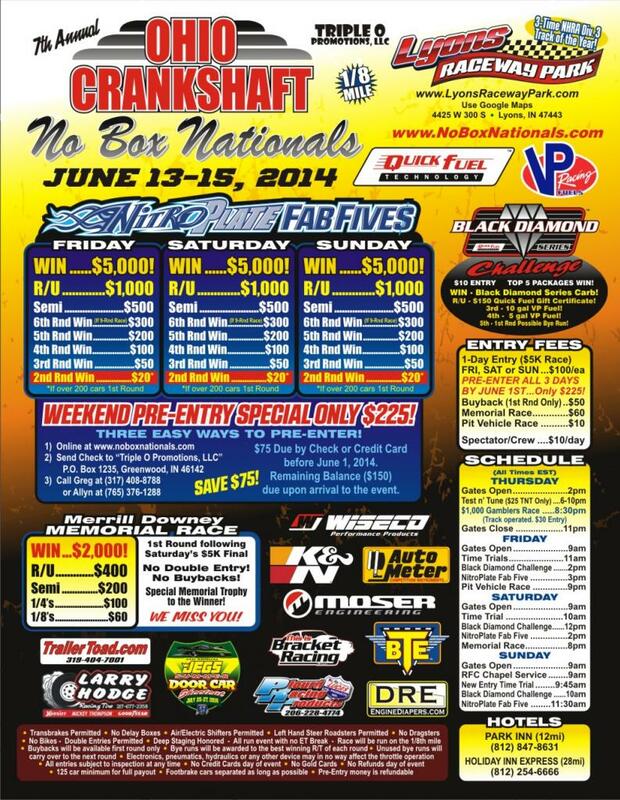 Galaltin, TN - This weekend showcases the Ohio Crankshaft No Box Nationals for the "No Box" guys, and 3 nice races for the "Top Bulb'r" Crowd. Buffalo Valley in Middle Tennesse, the Tripple Tens Plus in Edgewater, OH and Maryland's Top ET Tripple Header. Lyons, IN - Big things are happening in the little rural town of Lyons Indiana. 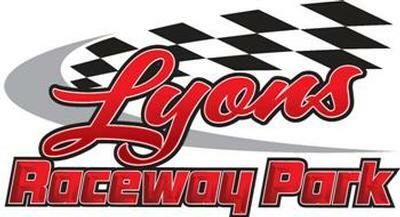 Just off Hwy 57 in Green County Indiana sits Lyons Raceway Park, an 1/8 mile drag strip nestled in between corn fields and turkey barns. Some may not even notice it is there, but racers and fans of the Division 3 National Hot Rod Association have sure taken notice! 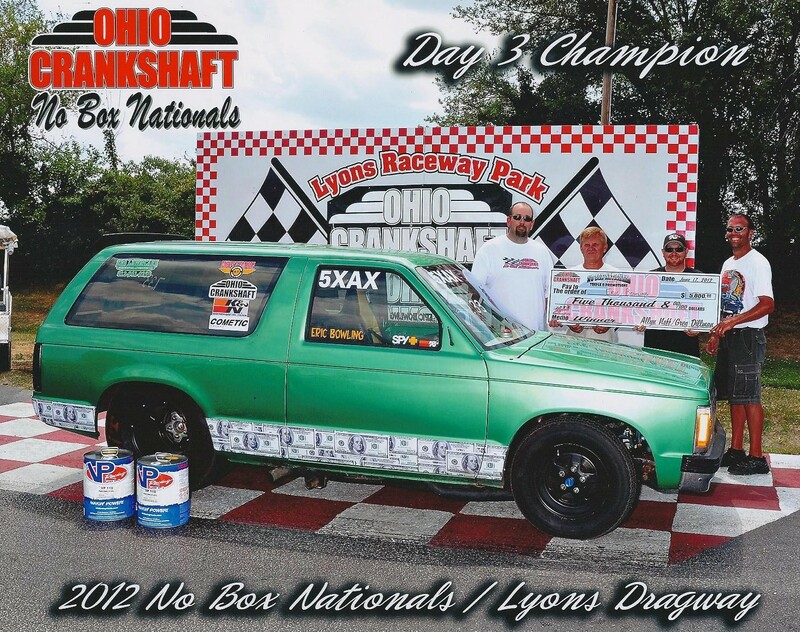 Lyons, IN - One of the most coveted No Box races has become the Ohio Crankshaft No box Nationals. 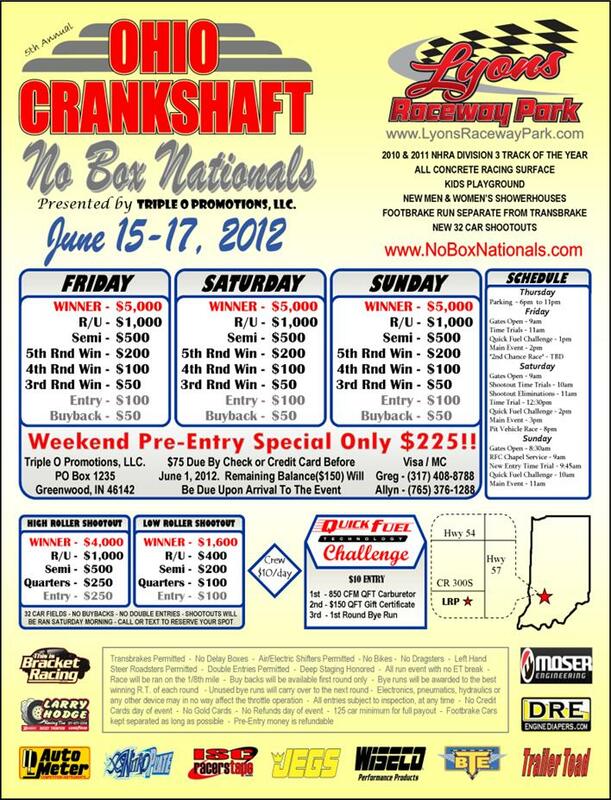 Held this weekend June 15th - 17th at Lyons Raceway Park in Indiana, racers from across the country will be in attendance. $5,000 to win action all 3 days with early parking on Thursday.